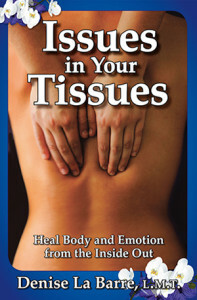 Got Issues in Your Tissues? Take the QUIZ!! An Invitation to Your Inner Child to Play! Coconut oil – Who knew? What are Your Hips Saying? The Healing Power of Turmeric! I am an emotional intuitive, a “Body Whisperer” if you will. I have been listening to bodies with love, and connecting the psychological and emotional dots since I was very young. My passion is to bring body-emotion reconnection to the world. We are designed to be connected in our bodies and feeling our feelings, but most of us are socialized out of that connected awareness, often very early. The journey to wholeness includes physical-emotional exploration and reconciliation in addition to mental-spiritual work. Often the best way to learn about my work is from someone who has experienced it. 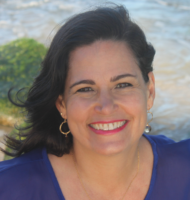 In this Radio Interview with me, Denise LaBarre, on Off the Record – hosted by Bill Best on KAKU, 1/17, you get to hear directly from my client, Yvette Crosby, as she describes her life-changing transformation through doing Issues in Your Tissues private sessions with me and by reading my book. Toward the end of the interview I give a short demo of my Square Breathing technique. To get your printable download of my Square Breathing Exercise, Click here. Catalyze Your Healing & Buy Your Copy Of The Book Today! What is a Healing Catalyst? © Healing Catalyst and Denise LaBarre. All rights reserved.